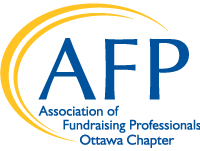 Thank you for your interest in joining or getting more involved with the Association of Fundraising Professionals Ottawa Chapter! AFP Ottawa is truly a diverse community — of people who make a life bringing people together to support efforts to create a better community, country and world. We actively seek and achieve a broad representation of experiences, perspectives, opinions and cultures. After all, inclusiveness is an essential source of vitality and strength for the effective pursuit of an organization’s mission. The advantages of joining, getting involved, and providing support to your professional association are many. Most important, it helps your career and your charity to advance! Fundraisers operate in a world of urgent needs, changing public opinions, and evolutions in legislation and demographics. AFP Ottawa has the tools that you need to help your community find the joy in giving, to advance your charity’s mission, and to propel your career. Educational and networking opportunities, our Fundraising Day Conference and the Philanthropy Awards are popular draws. The mentorship program for those new to the profession, CFRE study groups for those advancing to the next level and information updates meet the needs of fundraisers at all levels. We warmly invite you to explore joining us a member, actively taking part and doing what you can to support this lively, sharing, professional community of peers. For more information, please read our Chapter Policies & By-Laws.